The Industrial Series Nickel Iron batteries are imported from one of the largest battery factories in the world, located in Sichuan province of Western China. This production facility has been building batteries since 1971, and is known for producing the highest quality batteries available. These batteries have to be shipped as a Hazmat item with the electrolyte installed. The Last Battery you’ll ever buy? Over a century ago, Thomas Edison found a battery design that he considered to be nearly perfect. Today, nickel-iron batteries (NiFe) have an updated version that is specifically manufactured for off grid and renewable energy systems. 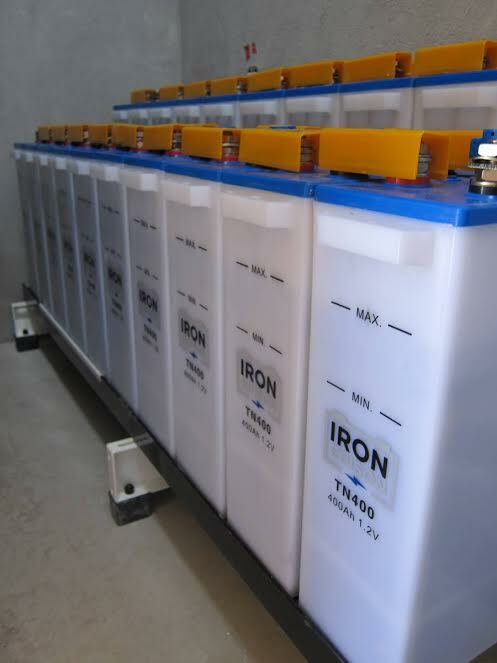 A nickel iron battery with refillable alkaline electrolyte has a large storage capacity (up to 48 kilowatt hours) for either 12, 24 or 48 volt systems. This nearly indestructable battery can be discharged to 80% of its capacity without any harm. Some of Edison’s batteries are still in operation. With a 30 year life expectancy the electrolyte can be changed and the battery is good for another 30 years. Potassium hydroxide is the electrolyte that Edison used for 25 years of operation. The addition of lithium hydroxide adds another 5 years to the expected operation lifecycle. Each group of 10 cells @ 1.2 volts, makes a 12 volt module. Multiple batteries can be wired in series and parallel for higher voltages and more amp hour capacity. Ability to survive frequent cycling is due to the low solubility of the reactants in the electrolyte. Unlike lead acid batteries, the plates of the NIFe battery do not dissolve into the alkaline electrolyte. There is no sulphation because the plates don’t change state. Lead acid batteries are susceptible to damage at temperatures above 80F and below 32F. The supporting structure of a lead acid battery could melt at higher temperatures. Nickel Iron batteries have a steel construction. The nickel and iron plates never dissolve into the electrolyte; they always remain in their solid metal form. Low temperatures may slow down performance but when the battery warms back up, there will never be any loss of capacity. Using Nickel Iron for your off grid or renewable energy storage needs is a great idea. Vastly outlasting the 7 year life cycle of their lead-acid counterparts, Nickel-Iron battery systems are quickly becoming the environmentally sensitive choice for off-grid and renewable energy systems. It is important to compare the available amp hours in these batteries to the amp hours available in a lead acid battery. With Lead Acid you can only discharge 20 to 30% of the total battery capacity to get 5 years’ of life. This means over sizing the lead acid battery, which causes problems with the number of parallel strings and with having the proper inputs to recharge a huge battery. We recommend a balanced system, which includes having a battery that can be recharged in one day with extra power to keep running your loads at the same time. As an example, compare the nickel iron battery to a 24 volt 1200 amp hour lead acid battery with a recommended depth of discharge of 30%. The lead acid battery would provide 360 amp hours of available capacity. At the very most, 600 amp hours would be available if discharged to 50%. This 50% DOD will shorten the life of a lead acid battery to less than 5 years. To achieve the same capacity with nickel iron, we would recommend a 500-600Ah Ni-Fe battery. The smaller 500 Ah cell would be sufficient and would provide 350 Ah at 70% depth of discharge. The 600 Ah cell would be more than sufficient and it offers a larger electrolyte capacity than the 500Ah cell size. In this example, the 600Ah cell would offer 480Ah of available capacity with 80% DOD and 300Ah at 50% DOD. The alkaline electrolyte in the USA series nickel iron battery is a formula patented by Encell which consists of KOH, (potassium hydroxide) and LIOH, (lithium hydroxide). This new electrolyte mix will provide over 11,000 cycles before needing an electrolyte refresh. In other words, this battery can work for 30 years before needing a change of the electrolyte. The combined solution of potassium hydroxide and lithium hydroxide improves the batteries performance (e.g. cycling life, energy efficiency, wide operational temperature range). The different standard concentrations of electrolyte allow the NiFe battery to be operated within a temperature range of -4F to 140F, allowing the battery to be able to withstand wide temperature fluctuations that exist in some remote regions. 1. The oxidation from a lower to a higher oxide of nickel in the positive plate. 2. The reduction from ferrous oxide to metallic iron in the negative plate. The oxidation and reduction are performed by the oxygen and hydrogen set free at the respective poles by the electrolytic decomposition of water during the charge. The charging of the positive plate is therefore simply a process of increasing the proportion of oxygen to Nickel. The action which takes place in an Edison cell both in charging and discharging is a transfer of oxygen from one electrode to the other or from one group of plates to the other. This is called an oxygenlift charge equation. In a charged cell, the active material of the positive plate is superoxidized (Nickel III, oxide-hydroxide) and that of the negative plates FE(OH2) is in a spongy or deoxidized state. The charge rate for the nickel-iron battery can be as high as C/5. This is the capacity of the battery X5, in amp hours. For a 500 Ah battery the C/1 rate is 500/5 or 100 Amps per hour of charge current. You can charge the battery using any MPPT or most PWM charge controllers and achieve specific charging voltage. The nickel iron battery is able to withstand a boost charge and these short duration high rate charges can be given provided that the temperature of the electrolyte does not exceed 115 degrees F. These short charges are very efficient and cause no injury. Rates up to three times normal can be employed for periods of 30 minutes and this is normally done with a generator. Normally the battery gets charged to 1.65 volts per cell. With a 12 volt nominal battery we typically use 10 X 1.2 volt cells. When charging, this 12 volt battery should achieve a voltage of 16.5 volts. When working with specific inverters, one fewer cell in series can be used. This allows achieving the higher per cell voltages without going over the inverter limits. Considering that the NiFe batteries perform at up to 118% of rated capacity, the nominal loss of a single cell does not affect total capacity. These cells like to be worked. Charge them up and push your batteries hard with a heavy load. You will find that the battery will perform better with heavy use than if you let it sit in a float state. In discharging the positive plates deoxidze and the oxygen with its natural affinity for iron, goes to the negative plates, oxidizing them. It is permissible to continuously discharge up to 25% above normal. This would be at C4. Occasionally and for short periods, rates of up to 6 times normal can be achieved. Normal would be C/1. Nickel iron batteries do have calender fade and they will lose power when they are not used. Lead acid batteries also have calender fade; however lead acid batteries do not recover if the voltage gets too low too often. Nickel iron totally recovers from a low depth of discharge and the batteries function well when used on a daily basis. The batteries do require watering with distilled water from time to time. Be the first to review “Nickel Iron Battery (Industrial Series)” Click here to cancel reply.